In the event of a nuclear emergency and the subsequent release of radioactive iodine into the atmosphere, Potassium Iodide (KI) is recommended for use as an aid to protect the thyroid from absorbing toxic levels of radiation. When used correctly, potassium iodide anti-radiation pills can prevent or reduce the amount of radioactive iodine taken up by the thyroid gland. 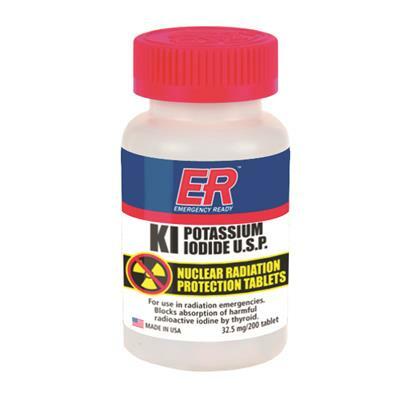 Why do you need Potassium Iodide? The Federal Government only has enough potassium iodide for people living within 10 miles of nuclear reactors in the United States, according to U.S. officials (U.S.N.R.C. - United States Nuclear Regulatory Commission). Therefore, it is up to us to prepare ourselves and our loved ones for unexpected disasters such as Fukushima in Japan. Dimensions: single (1): 2 x 2 x 4"
Infants (birth-1 month): crush ½ tablet & mix with milk, formula or water. Potassium Iodide (KI) helps shield the thyroid from radiation damage after a nuclear blast. Made in the USA. Includes 200 tablets. Product Shelf Life: 2 years from MFG Date. Take Potassium Iodide radiation pills in the event of a nuclear crises to minimize the absorption of radiation by the thyroid.